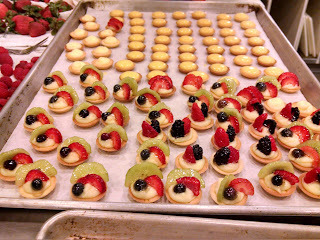 Yesterday I participated in the prep work for that gala event we'd been saving all those cookies and jellied fruits for. 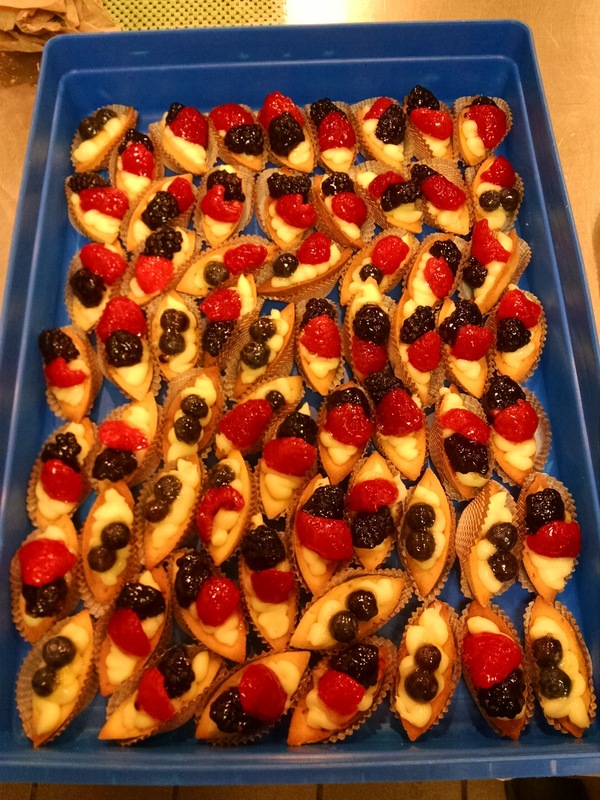 In addition to the 32 dozen cookies and the seven flavors of fruit jellies, the school wanted to send lots of mini cream puffs, mini éclairs, and mini tarts. Originally five of our class had signed up to work but only three of us were able to make it. With the Chef, we made two full trays each of cream puffs and éclairs, and tons of little tarts (round and barquettes). 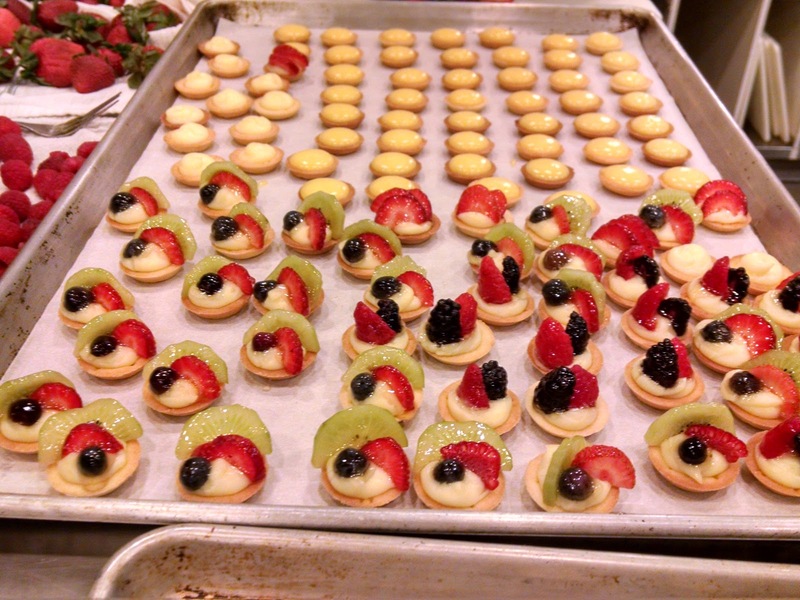 This involved a full batch of pate a choux, half batch of pate sucree, 4 batches of pastry cream divided into four flavors, a double batch of fondant also divided into four, a batch of lemon curd, and Italian meringue. We worked very, very hard. What was supposed to be a five hour day ended up being eight, but we got it done in time. 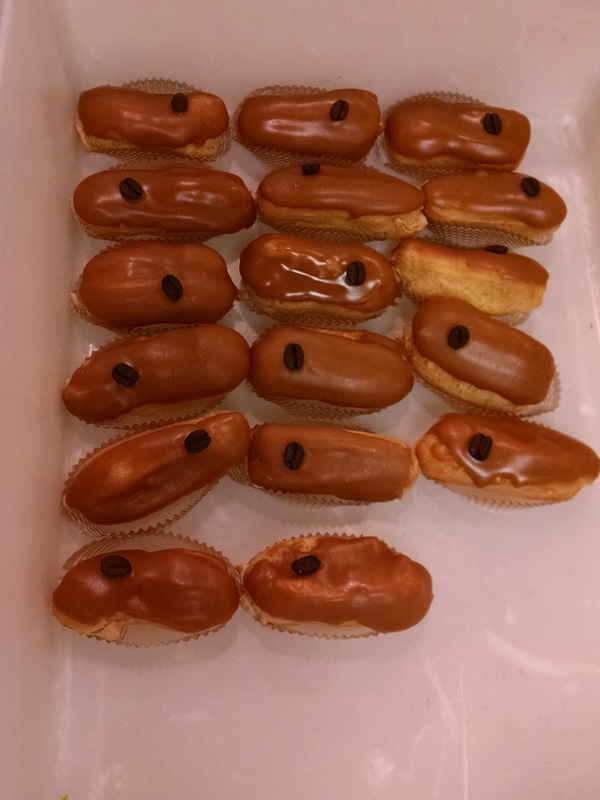 It was terrific practice; compared to when we first made pate a choux I noticed some improvement in my piping (I made the batch and piped all but a few cream puffs, the other two students did the éclairs) and I got to make more fondant which was something I wanted to work on again. I also made the lemon curd; it was a slightly different technique than the one I use at home so it was good to do it. 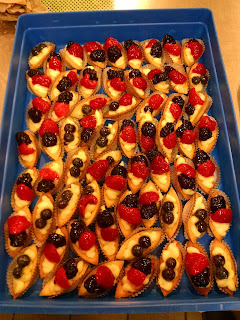 And the tarts were adorable - some of them had pastry cream and fresh fruits and others had the lemon curd with a bit of meringue browned on top. I wish I had more pictures but, honestly, there wasn't much time to take pictures with all the work we had to do.